There is something magical about camping with a campfire. After a long day of walking, exploring or just relaxing in the Great British outdoors, there is nothing better than getting back to camp and being greeted with the warmth and smell of a roasting hot fire. Campfires are perfect for cooking your simple evening meal and they make a great focal point for idle chats and stories told deep into the night. But campfires can be dangerous. If they aren’t treated with respect then they can be a danger to you, your loved ones and the environment, so it’s important that you use a campsite campfire responsibly. 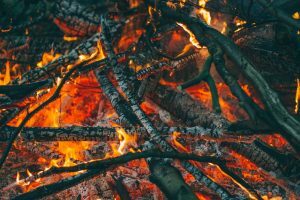 Although they are a firm favourite with campers, campsite fires are a dying breed, mainly because there aren’t that many campsites that permit them anymore. If you are dead set on a campfire, then you must choose a campsite that allows fires. Picking a location is the next key. Many campsites will mark out designated fire spots, usually circled by a ring of rocks or stones. If there are no marked spots then you should choose a clear spot away from trees, bushes and overhanging branches or vegetation. To make life easier, you should also look for a spot where there’s a natural windbreak. Making your own fire ring out of loose stones in the area will make your campfire easier to control. Before lighting your fire, you should have a plan for how you will put it out. If you are on a campsite it is good practice to identify the nearest fire point. 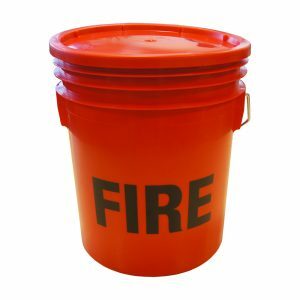 If there is no fire point then you should have your own fire bucket nearby filled with water, sand or fire absorbent powder. Choosing the right fuel is the next most important ingredient to a successful campsite fire. The most available source of fuel will almost always be sticks and firewood that you should collect from nearby woodland. Remember to respect your environment by only ever picking up firewood from the ground and never off standing trees. For a rip-roaring fire you’ll need tinder, kindling and fuel. Tinder should be no thicker than the width of a pencil lead and no longer than the length between your outstretched thumb and pinky. Kindling should be no thicker than your thumb and no longer than your forearm. And fuel should be about as thick as your wrist and about the length of your whole arm. Remember to start your fire off small and slowly add larger pieces to build it up. Never build a fire close to tents or vegetation. Keep tents and caravans far apart to prevent fires from spreading. If you are using a campsite stove or barbeque then make sure it won’t tip or blow over. Don’t use petrol, lighter fluid or other flammable liquid to start a fire. Use firelighters or dry tinder. Only build a fire as big as you need it. Keep a fire bucket close by. Make sure you fully extinguish your fire by bashing it with sticks or drenching it with liquid. Make sure all the logs and embers are cold before you leave the campfire.